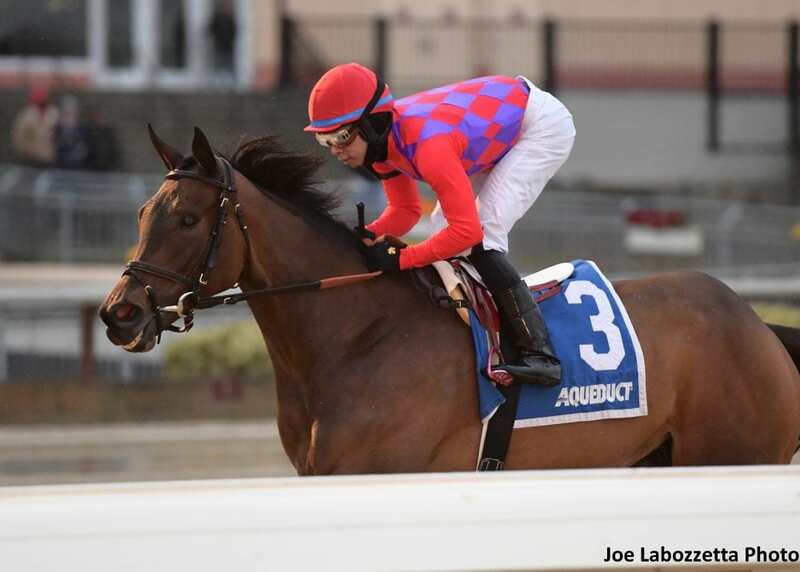 Lawrence Goichman's homebred Kathryn the Wise, with a powerful front-running performance, proved much the best in Saturday's $100,000 La Verdad at Aqueduct Racetrack. Breaking alertly under Manny Franco for conditioner Chad Brown, Kathryn the Wise went to the lead and never looked back, dominating her rivals over a sloppy Big A main track to earn a romping 10 3/4-length victory in the seven-furlong sprint for New York-bred fillies and mares 3-years-old and upward. Sent to post as the 8-5 mutuel favorite, the 6-year-old daughter of Uncle Mo reached the quarter-mile mark in 23.10 seconds and the half in 46.74 with Pauseforthecause, the 9-5 second choice, on her flank and Byself and Silly Sister stalking from a comfortable margin. Kathryn the Wise continued to improve her lead through the turn, opening up by 5 1/2-lengths at the top of the lane, and easily distanced herself from her rivals en route to a decisive score in a final running time of 1:25.22. Reylu Gutierrez, earlier today named an Eclipse Award finalist in the Apprentice Jockey category, kept to task with a rallying Playinwiththeboys to complete the exacta by a neck over Pauseforthecause. Starlite Mission, Sunset Ridge, Palladian Bridge, Silly Sister and Byself completed the order of finish. Out of Orbit and Satisfy were scratched. The lightly raced Kathryn the Wise has made a habit of recording dominant victories, taking her debut at Aqueduct in November 2016 by 5 1/2-lengths and her second start, an April 2017 allowance tilt at Aqueduct, by 12 lengths. In May 2017, Kathryn the Wise earned her first stakes win, 8 1/4-lengths clear of her nearest rival in the Critical Eye on a sloppy Belmont main. Whit Beckman, assistant to Brown, who was named an Eclipse Award finalist for Outstanding Trainer, said the track condition played its part in the facile score. Franco, the leading rider on the NYRA circuit in 2018, said his filly was relaxed throughout. “She was ready. I came out of there good and put her on the lead, because I talked to Chad [Brown] and he told me to go for it,” said Franco. “She was so comfortable in front and she was there for me. Kathryn the Wise banked $55,000 in victory while improving her record to four wins and one second from six starts. She paid $5.40 to win. Live racing continues on Sunday at Aqueduct with an eight-race card. First post-time is 12:50 p.m. This entry was posted in Racing and tagged aqueduct, Chad Brown, kathryn the wise, la verdad stakes, lawrence goichman, manny franco, new york-bred, nyra, Uncle Mo, whit beckman by NYRA Press Office. Bookmark the permalink.